Product prices and availability are accurate as of 2019-04-18 01:29:16 UTC and are subject to change. Any price and availability information displayed on http://www.amazon.co.uk/ at the time of purchase will apply to the purchase of this product. 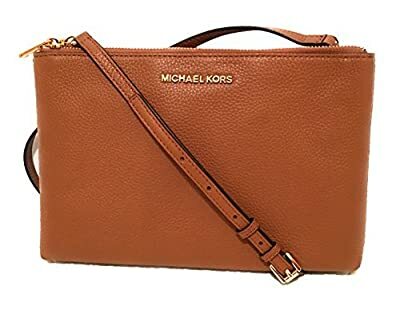 Michael Kors Brown / Acorn Monogram PVC / Leather Jet Set Cross Body Bag. Monogram logo Brown PVC on one side, Acorn pebbled leather. on the other. Gold-tone hardware. Logo lettering on front. Double top zippered closure. Middle open slip compartment. Interior: Signature lining, one zipped side has two slip pockets, other zipped side has 6 credit cards slots. Dimensions: Length 10.5 inches ( 27.5 cm), Height 7 inches ( 18.5 cm), Depth 6 inches (16 cm). Adjustable Cross Body Strap Drop 21-28 inches (54-72 cm).